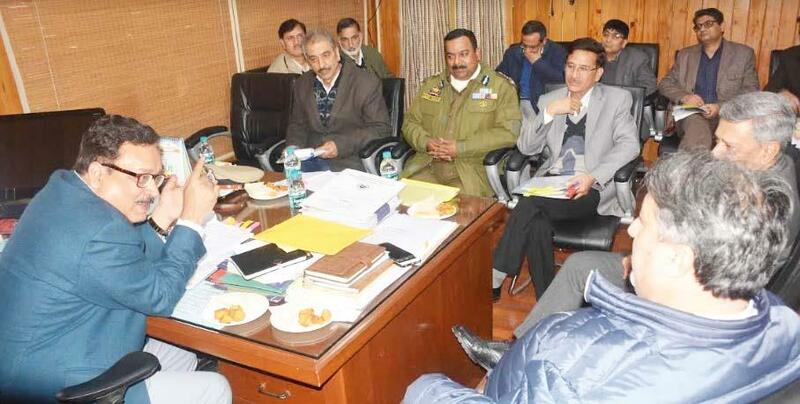 JAMMU, FEBRUARY 6: The Jammu and Kashmir government is all set to establish a hi-tech traffic control and surveillance system in the run up to execute its road safety plan aimed at arresting the rising fatalities on the state roads. The Road Action Master Plan being executed jointly by Motor Vehicle and Traffic Departments envisages creation of a state of art traffic control system, strengthening of enforcement agencies and other technological interventions for reinforcement at different levels. For the purpose, the State Government has released Rs 8 crore under Road Safety Fund in tune with the directions of the Supreme Court Committee on Road Safety. The Apex Court committee has called for establishment of non-lapsable Road Safety Fund in the States. Road Safety Fund has provision for allocation of expenditure for implementation of road safety related schemes, programmes, projects, purchase and installation of equipment and devises connected with road safety, conduct of studies, projects and research on matters relating to road safety, trauma-care programmes or activities, etc. This information was given here at a meeting of Road Safety Fund Management Committee chaired by Principal Secretary Finance Navin Choudhary(Chairperson of the Panel) and attended by Principal Secretary Transport Dr Asgar Hassan Samoon, Transport Commissioner S P Vaid, IGP Traffic Alok Kumar and other senior officers of the twin departments. The meeting took series of decisions with regard to utilization of Rs 8 Crore Corpus fund including purchase of 100 hi-end Combo Motor Bikes, lifting cranes and other vehicles to strengthen the surveillance on the roads through the enforcement squads. The interceptive vehicles to be used by MVD and Traffic department will have varied accessories and equipments including Speed hunter -III plus-speed laser gun, breath alcohol analyzer e-challaning machines and alike. Principal Secretary Transport gave a detailed resume of road action plan being executed by the department with main thrust on reducing rate of road mishaps, even as he said a considerable improvement has been recorded in this regard in past couple of months. IGP Traffic said that his department is working on a technology base Intelligent Traffic regulation System on the lines of modern cities. Earlier, Navin Choudhary took a detailed review of the fund utilization and asked the concerned to go for procurements. He asked them to make purchases through Government e-Marketplace (GeM) portal for transparency and fairness.